Park off the road at the foot of the hill (in the lay by). Either by minor roads from the A470 – from the Treforest roundabout, or from the Caerphilly road. SW take-off: Access to take-off is by foot and is short carry up the face of the hill (up the easily identified path). The preparation area is large and the take-off is friendly. There is also another path which goes up the face of the hill to the east by the fence – if you end up landing down this end this path may be more suitable. 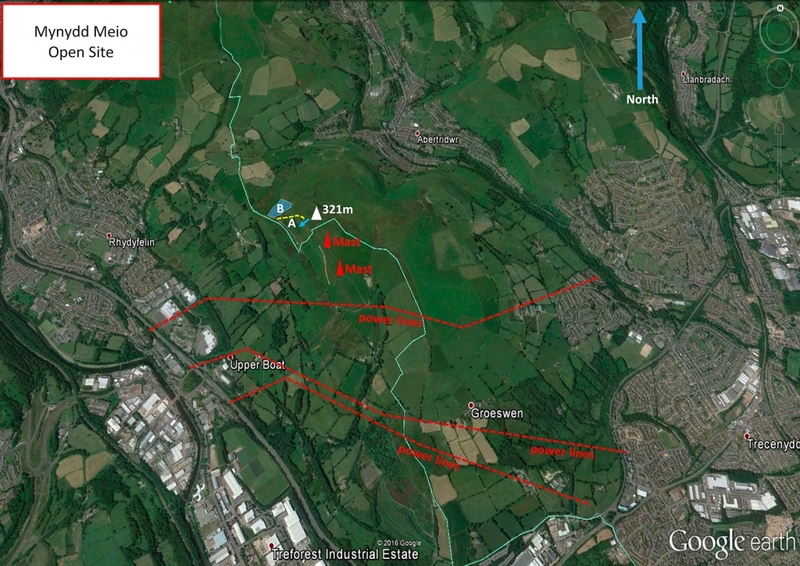 NW take-off – This is easily accessible by walking up from the road and directly up the NW end of Mynydd Meio. The hill is not usually flown in a NW wind as significant wind speed is needed to generate sufficient lift to maintain height easily. SW side – The top landing area is extensive and quite flat. Paragliders can bottom land on the open hill alongside the road (A), but there is not enough room to safely land a hang glider there. The emergency bottom landing field for hang gliders (B) is at the bottom of the hill to the right of take-off. This field is small and the landing approach difficult. Please do not fly a hang glider unless you are sure it is soarable, or you possess the necessary skills to land in the emergency landing field. Please do not land in any other enclosed fields, or climb walls or fences. NW side – The top landing area is fairly extensive and quite flat but because the lift band is narrow you may find it difficult getting high enough again to top land if you drop lower than the top of the hill. There is no defined bottom landing for the NW side so if you cannot top or side land then you may need to fly back towards the NW corner of the hill and land by the side of the road or in the emergency bottom landing field (B). Looking west from Mynydd Meio in the sunset. Photo courtesy of Alex Kennedy. 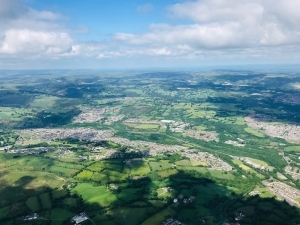 Flying here affords you a lovely panoramic view stretching from the Bristol Channel and Cardiff to the Brecon Beacons in the north when the weather is good. This site can be a good choice if Nanty Moel is busy. It‘s fairly friendly away from the power lines, but the short ridge length and narrow lift band limit the capacity of this site on non-thermic days. Be aware the airspace ceiling is 4000 ft. Looking down on the valley towns of Nelson and Treharris just to the north of Mynydd Meio (having come over Mynydd Eglwysilan). Beware of power lines and the TV masts. Keep a sharp lookout for model aircraft. Be respectful of the wild horses which live on the top. Be careful of rocks and fences when soaring in close to the ridge. The A470 valley in front of take-off is full of power lines and pylons, pilots should therefore not attempt to fly to the valley bottom. Beware and be considerate of the model aeroplane flyers. If flying the NW side in strong winds then expect wave off the ridge and hills in front (Mynydd Eglwysilan). The field to the north of the hill is occasionally used for clay pigeon shooting. Do not fly immediately down wind of this field when shooting is taking place. This site is frequently used by model aircraft pilots, please respect their right to fly as well as your own. This site is rarely used for XC although over 50 km has been flown from here. Flying across the valleys in thermic winds can understandably put pilots off. Potential can be limited by sea breeze although you can often get away before the sea breeze comes in. Although the site sits within a 4000ft airspace limit this rises to 5500 ft after one or two glides. 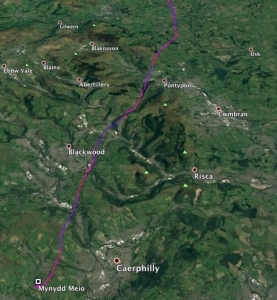 When you do get away you will have the choice of heading further north up into the valleys (with the rising ground) or heading more eastwards for a quicker exit from the valleys system. Once clear of the valleys you will have to track northwards to avoid the river Severn (and any associated sea breezes). Retrieves from the valleys back to Cardiff are usually straight forward if you can get on the valleys train lines. PG – Pawel Barton flew 56.5 km on his Nova Ra on 09 August 2009. Mynydd Meio Mountain East of the Upper Boat roundabout off the A470 (near Treforest Industrial Estate).